I came across a great article by Geoff Stein on indoor palms and I thought it was great enough to share. 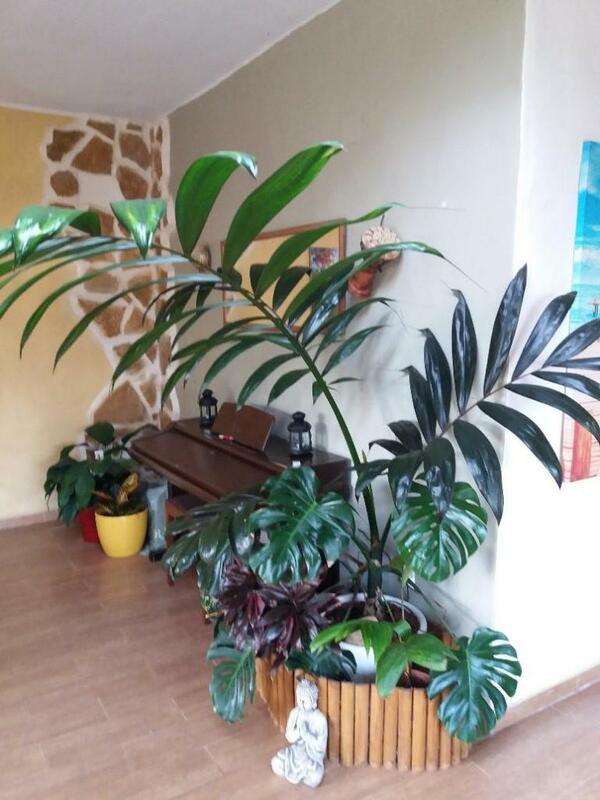 Most importantly, he names specific palms that can thrive indoors along with common pitfalls and marginal/poor indoor palms. It's interesting to learn from Phil's article that Chambeyronia is doing great indoors, but not so according to Dave's Garden. Has anyone grown Chamby successfully inside? 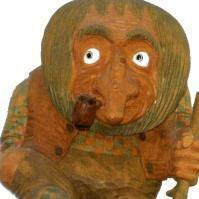 Thanks for posting Pando. Betrock's also claims that Chambeyronia is a good indoor palm, however, I have not had success with that species. Anyone have any success or failure stories? 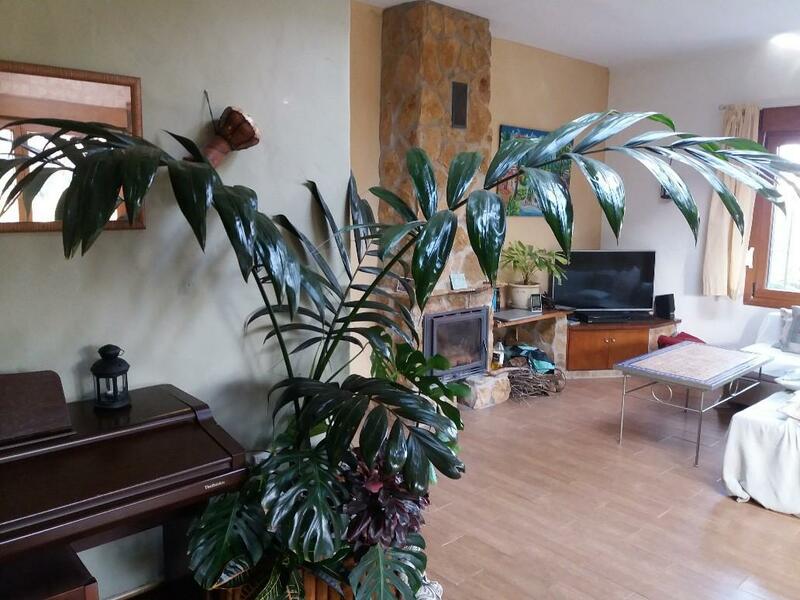 It would be such a beautiful palm to grow indoors! 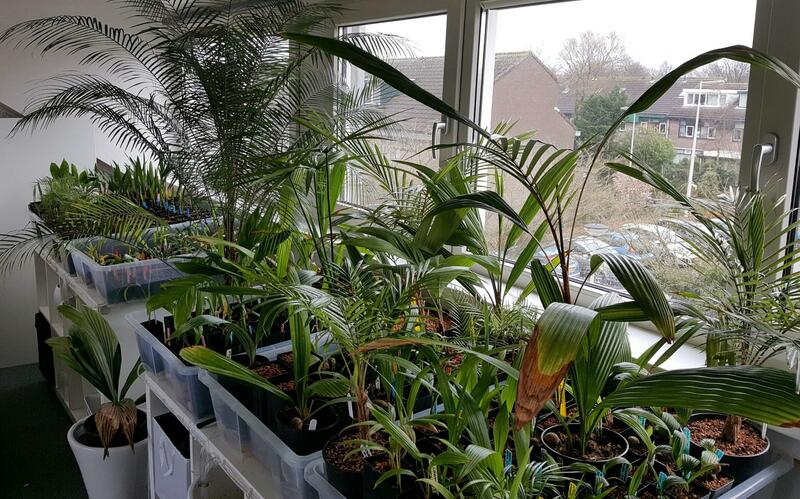 What would be great is if we can compile an updated list of "solid" and "likely" palms that would grow well indoors for us who are not blessed with warm, hot weather....It could be like a copy and past list that would be updated as the thread evolves. Chambeyronia is pretty easy in my experience. This one's been inside in the winter for about 8 years. During the summer it gets moved to the greenhouse. It's one of six grown from seed. The others rotted early on due to badly draining soil. 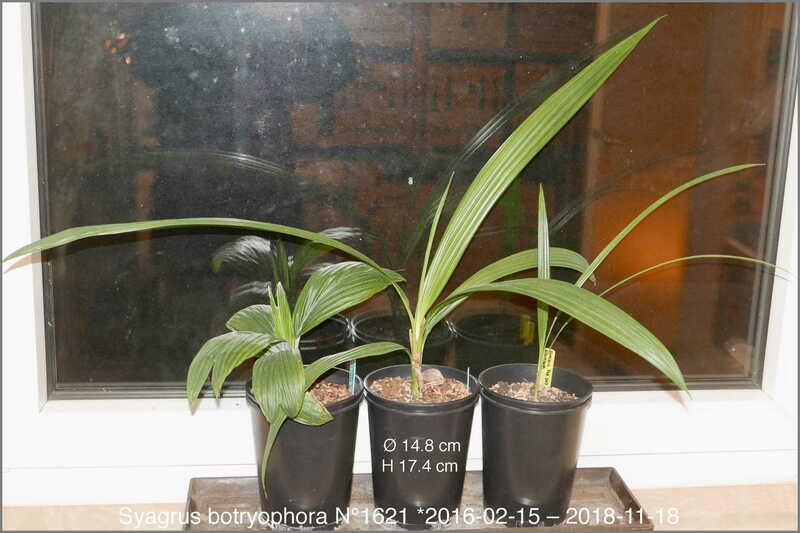 I've been growing quite few palms indoors with success and will list what I have here. ALL of them have been indoors for at least 1 year and that is my criteria for success is to live through the various seasons of sunlight as well as heating and cooling the inside of the house. Lytocaryum weddellianum, hoehnei, insigne and itapebiense, Allagoptera caudescens and leucocalyx, J. altifrons and magnifica, Attalea maripa and one to be identified, Licuala terrenguanensis, peltata var sumawongi, Phoenix rupicola, Ceroxilon quindense, Syagrus botryophora, schizophylla, russchiana, schizo x roman and campylospatha, Beccariophoenix alfredii and madagascariensis, Jubaeopsis caffra, Parajubaea cocoides and sunkha, Jubaea chilensis, Archontophoenix tuckeri, Chamaedorea radicalis, metallica, tuerckheimii, tepejilote, microspadix and some to be identified, Gastrococos crispa, Reinhardtia gracilis, Dypsis poivreana, Loxococcus rupicola, Phoenicophorium borsignianum, Oraniopsis apendiculata, Cyrtostachys renda. It's the top floor of my house which is not heated but stays always above 18C in wintertime. The windows are south facing. On the other side of the room is another row of windows letting in some additional indirect light. Large IKEA boxes (Sweden 2nd for sure!) with each 2 small holes drilled in 2 corners. 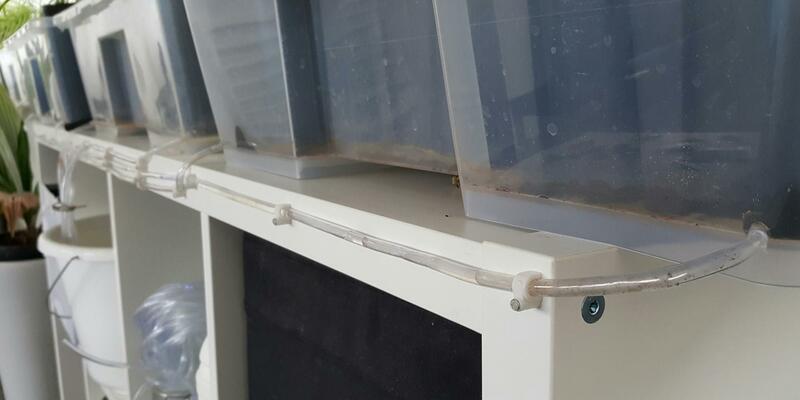 Aquarium hoses were attached and they lead the excess water into a bucket. It works fantastically. I have allready seen significant growth and health progress since 1: placing my plants in this light and unwarmed room, 2: using Pal's mix, 3: ensuring excellent drainage. ^^^^^^THAT is impressive and total dedication! Kai this is a very successful science project...goood for you. @Kai And I can see N°1405 is very happy on its 3rd birthday today. Yes Pal, it is very happy. Even though it didn't get any presents. Better than lots of presents is growing together with sooo many other palmy friends! Kai, I’m missing in your list the magnifique Sabinaria. @Pal Meir List your palms that you keep indoors...we would really appreciate it! Oh yes, I forgot that one, it's still thriving don't worry. Also forgot Mauritia flexuosa, Astrocaryum aculaetissimum and alatum and Licuala ramsayi. 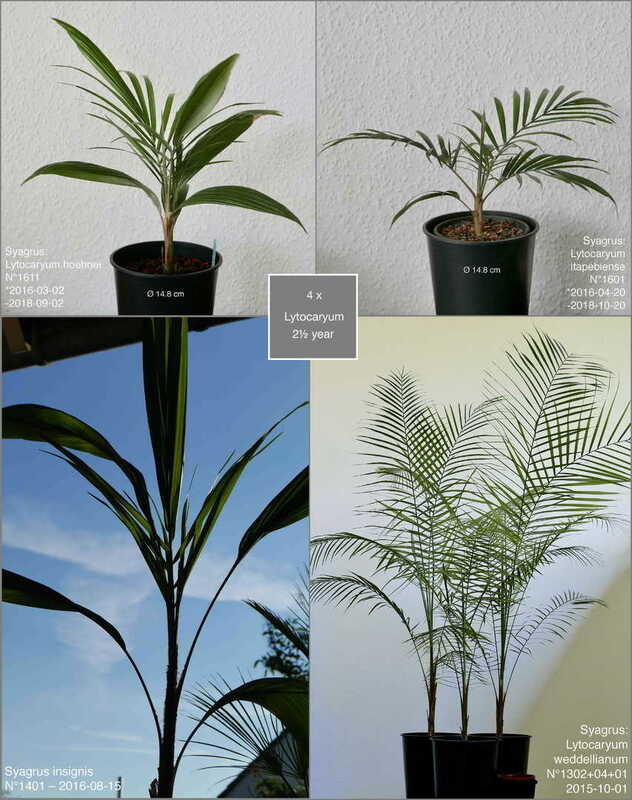 Which cocosoid palms (apart from lytocaryums) would be best suited to indoor light conditions in your experience? From what I've gathered syagrus schizophylla could be a promising candidate, being a small understory plant and all. 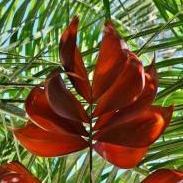 Syagrus botryophora and even s. romanzoffiana 'Santa Catarina' can withstand partial shade according to some sources. Can anyone concur? Not all Lyto spp are good indoor growers, only L weddellianum and L itapebiense. Hmmm, the reason why S. botryophora got my attention in the first place was the supposedly faster growth rate compared to romanzoffiana. Strange if it's reversed indoors I wouldn't mind a fast grower for a change, that's a criteria. I have a Cocos nucifera but I was lead to believe they're picky when it comes to light and especially temperature. It is my first winter growing these so it's a bit confusing still. I think I at least got the soil mix right, the cocos was planted in seramis / pine bark and looks happy enough. I still like the idea of having a syagrus around, I'm just not sure which one of the three species mentioned to go for. The way I see it they'd all need extra light, schizophylla would be the easiest to keep in check but I'm radiating towards botryophora or romanzoffiana because of their size potential. Which ever is faster indoors would take priority. I do have a couple of kentias in case my other choices turn out impossible to maintain, but I welcome a good challenge! Why don’t you try Chamaedorea spp, e.g. Ch seifrizii, a clustering rocket? Kai, what is the average temperature in your growing room? especially during winter? How about humidity levels. Replying to an old thread, just thought I'd let you know Chambeyronia has done well for me indoors, with enough light.... no problems with any kind of mites, etc... only trouble is each new leaf is much, much larger than the previous, you need plenty of space! Hello, so I have some potted Sabal minors indoors that are doing well for the most part, but some seem to be "stuck" and just wont grow much. I am wanting to provide them with heat but they are in a small space. Does anyone know of anything that can safely provide a small area with heat for growing plants indoors? I could really use something like this, please tell me if you know about anything that might work!